That was Microsoft CEO Steve Ballmer in an interview last year with The Wall Street Journal. At the time, Microsoft was on the verge of releasing their first Windows Phone 7 devices, and knew their best hope in the market would be to go after Android — the same OS which quickly ran Windows Mobile into extinction. In the months that have followed, right or wrong, it looks like Microsoft is slowly but surely forcing Google’s OEM partners for Android to agree with this stance. The reality is that for an increasing number of these partners now, Android is not free. It doesn’t require the licensing fees that Windows Phone does, but it does require a patent fee. A fee paid to Microsoft, not Google, mind you. If Microsoft is able to convince (or force) Samsung to pay this fee as well, it’s likely lights out for Android as a free OS, as Tom Krazit rightly points out on paidContent today. And with Microsoft and now HP offering their own rival mobile OSes backed by a vast array of patent protection, some of these OEM partners may begin to think twice about their firm Android commitments. At least, that’s undoubtedly Microsoft’s hope. Android as a free mobile OS that rivals iOS in terms of functionality is an unbelievable value proposition. But Android as an OS that requires you to pay Microsoft for each unit shipped is less so. Google’s last great chance to save Android in this regard may have been the Nortel patent purse — 6,000+ patents spanning mobile and wireless innovation. Unfortunately, the search giant lost the rights to those patents in a bidding war with their rivals. As a result — pending government inquiries surrounding the antitrust implications of all of this — Android remains very vulnerable. Perhaps more so than ever. But the story of just how Google failed to secure these patents — which many had assumed they’d win — may be even more fascinating. This Canadian court document (PDF), made public on Wednesday and linked to by Krazit in his piece, details exactly how Google lost the Nortel patents. The entire document is extremely long, but most of the good parts are in the earlier parts — aside from the documents later on in which Google’s name as the winner of the bidding is crossed off in favor of “Rockstar Bidco”, the name of the consortium made up of Google’s rivals that won. As everyone knows, Google kicked things off by putting down the “stalking horse” bid on April 4. This bid of $900 million ensured that the auction would take place, and put Google in the driver’s seat for it. This bid led many to believe that Google would eventually prevail as the winner of the Nortel patents. In fact, many inside of Google believed they would win as well, we’re told. The company even did a blog post outlining why they were bidding. Today, Nortel selected our bid as the “stalking-horse bid,” which is the starting point against which others will bid prior to the auction. If successful, we hope this portfolio will not only create a disincentive for others to sue Google, but also help us, our partners and the open source community—which is integrally involved in projects like Android and Chrome—continue to innovate. Google chose to use the name “Ranger” for their bidding. Meanwhile, others interested in the patents began to organize themselves for the auction which would take place at the end of June. At the same time, the U.S. government began looking into the bidding to determine how the outcomes might affect the mobile and patent ecosystem. The DoJ quickly determined that a Google win would be okay, but they weren’t as sure about Apple, apparently. At the same time, Microsoft began to complain that the auction could result in a termination of the existing licensing agreements they had on the Nortel patents. And while they never specifically mentioned Google, it was pretty clear that they did not want Google winning — such a victory would eliminate at least some of Microsoft’s patent leverage over Android. But this complaining was odd since we had heard that the existing licensing agreement on the Nortel patents would have to be honored by any winning bidder. So what was Microsoft complaining about? At least some believe Microsoft was just playing mind games at this point — mind games which would later come into play. Ultimately, four different parties were chosen by Nortel to be allowed to make bids on the patents, in addition to Ranger (Google), the stalking horse winner: Apple, Rockstar Bidco (a consortium — more on that in a bit), Intel, and Norpax (an affiliate of RPX Corporation). The auction commenced on June 27 at 9:15 AM in New York. Intel made the starting bid — it’s not clear what that bid was, except that it was over the $900 million initial Google bid. After Intel, everyone was told that the minimum bid increments would be $5 million. All of the remaining bidders made bids. The Nortel group looked them over and determined to raise the threshold for the bid increments to $50 million from $5 million — thus beginning round two of the auction. This time, only three bids were received. Norpax did not bid. A new leading bid was declared (unknown) and Nortel decided to up the increments to $100 million. Because Norpax had not bid, they were removed from the auction and the number of participants fell to four: Ranger (Google), Apple, Intel, and Rockstar Bidco. It was around this time that Google began making odd bids, based around mathematical constants. The Nortel group was apparently confused by the seemingly random numbers Google was bidding. Reports have stated that they weren’t sure if Google was “extremely confident or bored”. Others believed Google was trying to confuse their rival bidders. Still, while Nortel may have not known what to think, Google remained in the race. By the fifth round of bidding, it was Rockstar Bidco that decided not to submit a bid. This brought the group of bidders down to three: Google, Apple, and Intel. Then something really interesting happened. Following Rockstar’s seeming exit, Apple asked Nortel for permission to talk to the group about a possible partnership. This request was granted. Following these discussions, Apple decided they wanted to partner with Rockstar and adopt their name and transaction structure. 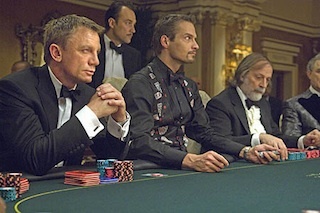 Essentially, Apple decided to stake the Rockstar group in this high-stakes poker game. 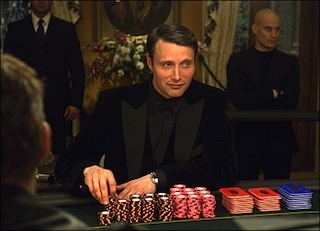 If you’ve seen Casino Royale (the remake, not the original campy version), you’ll recall the scene where James Bond loses all his money attempting to call what he believes to be a Le Chiffre bluff. He is forced to exit the game, but then Felix Leiter, the CIA operative also in the game, tells Bond he’ll stake him since he’s clearly the stronger player. Again, that’s more or less what Apple did with this maneuver to Google’s Le Chiffre. After the sixth round of bidding, Intel indicated it too was withdrawing. At this point, the two remaning groups were allowed to discuss partnership opportunities with all of those who had withdrawn. By the end of the eight round, Ranger (Google) partnered with Intel. It was now down to Ranger (Google + Intel) versus Apple (staking Rockstar). For the next 10 rounds, the two sides traded bids in $100 million increments. By the 19th round, Apple (Rockstar) presented a $4.5 billion bid. Ranger (Google) asked for permission to take some time to think about making another bid, this was granted. They ultimately decided not to continue. Apple (in partnership with Rockstar) was declared the winner. While much of the press after the auction focused on the Rockstar group’s win, the court documents make it very clear that it was actually Apple that won in partnership with Rockstar. Apple was the only group that had not dropped out. Again, they staked the Rockstar group to ensure a victory for the stronger player. Why was Rockstar the stronger player? Because of the other companies involved. RIM, EMC, Ericsson, Sony, and yes, Microsoft. All of those groups together had the cash and clout to break Google’s will. And with Microsoft, there was clearly the desire. But why on Earth was Microsoft doing bidding on patents they already had licensing rights to? That’s not yet clear. But one has to assume that they simply did not want Google winning them — at all. Even if Microsoft maintained licensing rights to the patents, a Google win would ensure that it would be a lot harder to sue Android and its OEM partners for other patent infringements. So it sure looks like Microsoft teamed up with longtime enemy Apple to ensure victory. And if the U.S. and/or Canadian governments don’t now either block this result (which seems unlikely given that they approved the bidders beforehand) or force fairly drastic changes (such as they did in the Novell patent case) — which Google will have to lobby heavily for — Android seems to be in some very serious trouble. Things didn’t ultimately end well for Le Chiffre, remember.